Survivor 28: Cagayan (2014) - 11th place, 8th out - 1st juror. Voted out in Episode 7, "Head of the Snake" (Day 19). Survivor: Game Changers (2017) - Winner, 7-3-0. Received seven jury votes to win in Episode 14, "No Good Deed Goes Unpunished" (Day 39). Cagayan Ep. 1 RC/IC: "Draggin' the Dragon" - Solves the puzzle for Aparri, which narrowly finishes second (2nd*/3). Cagayan Ep. 2 RC/IC: "Phish Farm" - Does the puzzle, passing Luzon for an easy Aparri win (1st/3). Cagayan Ep. 3 RC/IC: "Mazed and Confused" - Tosses water, and eventually, Aparri wins! (1st/3). Cagayan Ep. 4 IC: "Octopus' Garden" - Swims and rebounds, but Cliff's basket-shooting thwarts her attempts to throw the challenge, sending Aparri to another second-place finish (2nd*/3). Cagayan Ep. 5 RC: "Kicking and Screaming" - Now with New Aparri, successfully (with Morgan) drags Lindsey from Solana's pole in Rd.1, but in the final bout is dragged by Tony/Trish, and Aparri loses, 2-1. Cagayan Ep. 6 RC: "Idol Hands" - Beats Jefra in her bout, but overall, Aparri loses, 4-2. Cagayan Ep. 6 IC: "Styx" - With Spencer, works the puzzle, but Aparri loses again. Cagayan Ep. 7 IC: "Bermuda Triangles" - Fourth to drop out, part of the mass fall-off at the Rd.3 transition (8th/11). Game Changers Ep. 3 RC/IC: "Austin's EOC" - Crosses obstacles for Tavua, who finish second (2nd*/3). Game Changers Ep. 4 IC: "Ow Pairs" - Retrieves bags, plates Tavua's 2nd table maze ball, and Tavua wins (1st/3). Game Changers Ep. 5 RC: "Unchained Medley" - Uses the grappling hook, and Tavua wins (1st/3). Game Changers Ep. 5 IC: "Box Car Blues" - Gets the keys, hits one target, and Tavua doesn't lose (2nd*/3). Game Changers Ep. 6 IC: "Cargo Salvage" - Now with Nuku, hauls stuff, but Nuku loses. Game Changers Ep. 7 RC: "Dulcimer Stomp" - Runs around the maypole to release the key, and Nuku wins. Game Changers Ep. 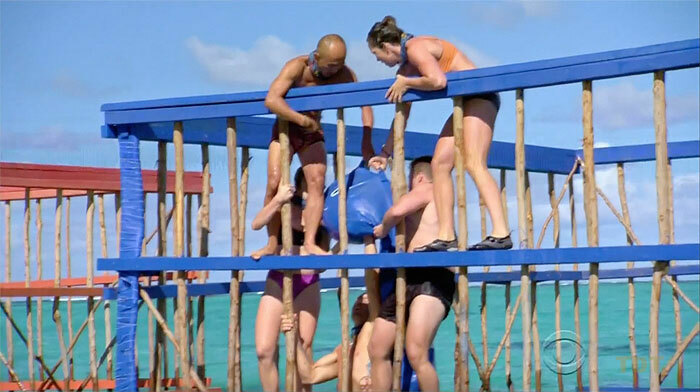 7 IC: "Plunge, Pop, Pull" - Pulls the raft along for Nuku, but Nuku loses. Game Changers Ep. 9 RC: "New School" - With Brad, swims and hauls the net for the losing team. Game Changers Ep. 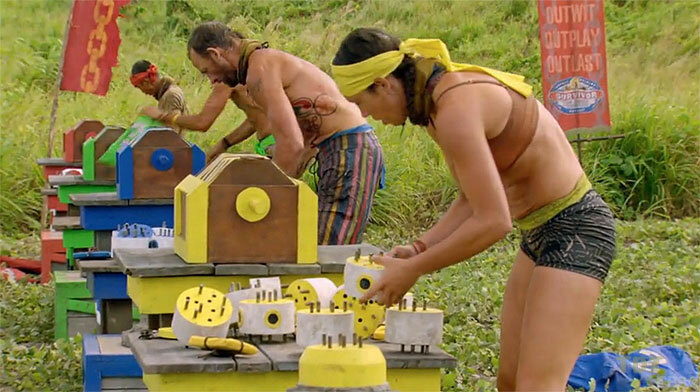 10 RC: "O Black Water" - Crosses water obstacles, helps Cirie, for the losing team. Game Changers Ep. 11 RC: "Angry Chair" - Helps haul people in the chair, for the winning team. Game Changers Ep. 12 RC: "Full Tilt Boogey" - Part of the losing blue team, with Michaela and Tai. Game Changers, Ep. 8 IC: "Keep on Your Toes" - Tenth person to drop out, over 25 minutes (4th/13). Game Changers, Ep. 9 IC: "Get a Grip" - Eighth person to drop out (5th/12). Game Changers Ep. 12 IC: "Can't Buoy Me Love" - Fourth person to drop out (6th/9). Game Changers Ep. 13 F7 IC: "Vertigo" - One of several people who does not beat Brad (tie-2nd/7). Game Changers Ep. 14 F6 IC: "Maybe I'm A Maze" - Last to reach the puzzle stage, almost catches Brad (2nd/6). Game Changers Ep. 14 F5 IC: "Spoon Man" - One of four people not to place a single ball (tie-2nd/5). Game Changers Ep. 14 F4 IC: "Final Four-titude" - Second to start the puzzle, does not win (tie-3rd/4). Cagayan, Ep. 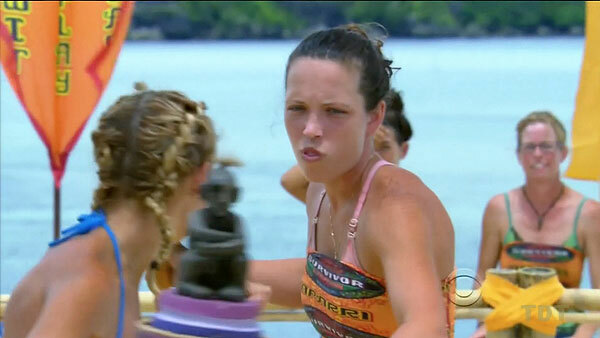 6: Alexis Maxwell (voted out, 6-1). Cagayan, Ep. 7: Six votes, from Kass, Tony, Trish, Woo, LJ, and Jefra (voted out, 6-5). Game Changers, Ep. 10: Retrieves the Vote Steal advantage after the RC (Day 25). Game Changers, Ep. 12: Receives the Legacy Advantage from Sierra (Day 32). Game Changers, Ep. 13 (F7 vote): Uses the vote steal on Tai, votes twice for Michaela, who is booted (Day 35). Game Changers, Ep. 14 (F6 vote): Uses the Legacy Advantage, voiding three votes against her, saving herself (Day 36). Game Changers, Ep. 13 (F7 vote*): Michaela Bradshaw, Michaela Bradshaw (voted out, 4-2-1). *Note: Voted twice for Michaela, using the Vote Steal advantage; also counts as two TCA. Game Changers, Ep. 14: Received 7 votes, from Andrea Boehlke, Aubry Bracco, Cirie Fields, Hali Ford, Michaela Bradshaw, Tai Trang, and Zeke Smith, to win (7-3-0). Am I on the wrong tribe, Jeff? Yeah, still on Aparri. Woo... aaaaw. Final six, guys! Nobody flip, okay? Eh, LJ has one, too. NBD. Wait, *I* got six votes? My word is *not* my bond! Tavua doesn't lose! Nothing more to see here, move along. Who *do* you trust, Tai? What's that under the bench? I wasn't even asked what I thought! 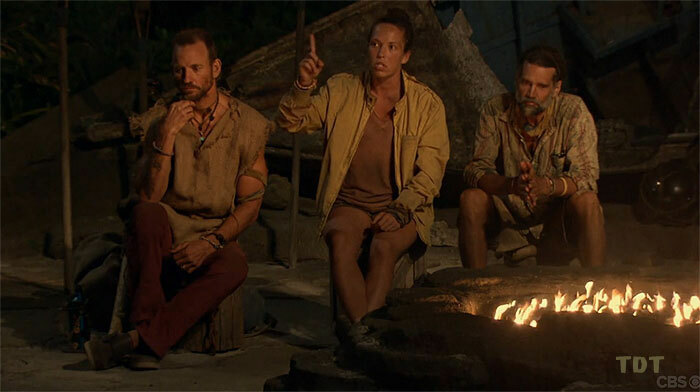 Gordon Holmes at XfinityTV.com (4/3/14): "Sarah: Kass was 'Wreaking Havoc Around Camp'"
Rob Cesternino at RobHasAPodcast (4/3/14): "Talking with the Latest Player Voted Off Survivor - 4/03/14"
Steve Helling at People.com (4/4/14): "Sarah Lacina: I Trusted the Wrong People"
Josh Wigler at Parade.com (2/20/17): "Sarah Lacina Swears To Do 'Whatever It Takes' to Win"
Gordon Holmes at XfinityTV.com (3/1/17): "Sarah: 'I Got So Much Grief for Not Playing a Vicious Game'"
Dalton Ross at EW.com (5/25/17): "Sarah Lacina on how Jeff Probst tricked her with final result"
Gordon Holmes at XfinityTV.com (5/25/17): "Sarah: '(Brad) Thought I Made a Lot of People Mad'"
Josh Wigler at Parade.com (5/25/17): "Sarah Lacina On Finding Her Inner Tony"
"Pet Peeves: I hate when I can hear people chew their food, when people leave me voicemails (I’ll call you back if I don’t answer) and stupid people. If You Could Have 3 Things on The Island What Would They Be and Why? A Bible - I’ve always wanted to read the entire Bible. I’m a slow reader, so I would be entertained for quite a while; a toothbrush; and a Surf board - Why not? I’m easily entertained, I don’t need much. Survivor Contestant You Are Most Like: I’m one of a kind. If I had to pick I’d say Malcom. He’s nice, but very strategic and tasteful about it. Why You Think You’ll “Survive” Survivor: I’m from the Midwest, cornfed! I’m a hard worker. I don’t give up. I motivate people. I learn quickly and I am a master manipulator. Do You Consider Yourself a Brain, a Beauty or a Brawn? I would consider myself Brain and Brawn. I think I will do very well on the puzzles and dominate the physical challenges.."
I’m more cut-throat now. I’m not out there to make friends and I’m willing to go against my word. I feel like I had so much game left. I’m not really proud of the way I played. I chose my word and loyalty over $1 million. I would not make that mistake again. I will do whatever it takes to win. The only purpose for me going back out there is to win a million dollars. I don’t care about making friends or what anyone thinks of me. They’ll get over it."